Suddenly you hear that loud and unmistakable sound of the alarm. You’ve heard that sound in fire and safety drills. What are you supposed to do? You try to remember the tips you picked up in those fire and safety sessions at work or those things you read while surfing the web. These are some of the things that might roll through your thoughts in the first few seconds after hearing that sound warning you of a fire. The adrenaline is flowing and you know that you must act fast. You should always assume a fire alarm is the real thing. Fire alarm systems and smoke detectors are sensitive and effective. It is possible that some prankster could have pulled the fire alarm. Maybe someone heating up a snack in the break room got careless and the smoke set off a smoke detector. Perhaps you’ve neglected something on the stove or in the oven. Don’t try to find reasons for the alarm. This is the time for immediate fire protection action. Do not panic! Regardless of where you are, home or work, stay alert and action-oriented. Get ready to evacuate. If your keys, purse and cell phone are handy, grab them. If at work, don’t worry about your work area or computer. 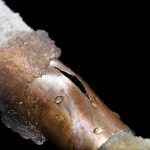 Your building is probably equipped with sprinkler systems . These will minimize damage. 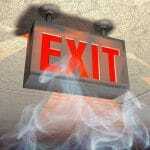 If you are in a multi-story building look for that exit sign and head for the stairway, forget about the elevator. If you are at home, get out as soon as possible. Things are replaceable, your life isn’t! If you are at work follow the plan for what to do and where to go once outside the building. In case of a fire in your home, get outside quickly and move as far away from your home as safely possible. In any environment you are likely to be surrounded by highly flammable objects. Fire moves fast. Regardless of where you are, the fire department will arrive quickly. Stay out of their way; do not attempt to assist them. They are well trained professionals, fighting fires and saving lives is their business and they are very good at what they do. Listen to what they say and follow their instructions. No one wants to think they may become the victim of a fire, but fire can happen anywhere, anytime. Think about these words you have just read. Seek out additional information. Prevention and preparation are your best weapons. Use them well! Contact Fire Control Systems for all your fire safety needs.